We are at a crucial political moment for the future of Catalonia. As stated by the President of the Generalitat of Catalonia, Mr. Artur Mas, exceptional moments demands exceptional decisions. This exercise of democracy is attracting a number of furious attacks against our country and our democratically elected President who has been brought to the Courts under the charges of rebelion and sedition. Reagrupament Independentista (RCAT), as a consequence, has decided to back our President, and to submit to the Courts a declaration of self-incrimination. This declaration states that “We (the undersigned) incriminate ourselves of the same charges brought against the President of Catalonia, and ask, to the Judges that, if a criminal process is follow against him, to be accused by exactly the same charges of sedition and rebellion and also to be tried in the same cause“. 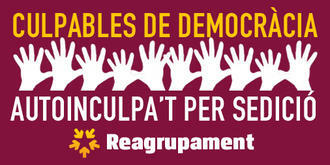 RCAT also makes a public call to all Catalan citizens, civil society, organisations and political parties to also self-incriminate themselves as a prove to support the President. Anyone willing to self-incriminate in those terms has to submitt a letter of self-incrimination to the Chamber of Civil and Penal Matters of the Catalonia Superior Court of Justice, located at the Barcelona Palace of Justice. One Response to Guilty of Democracy!